If you are craving some of that fixer upper style, these 14 farmhouse style wreaths are perfect for your front door! We just painted the exterior for our fixer upper. The transformation was so dramatic. I have a whole exterior paint series that I’m going to be sharing with you next month, so stay tuned. In the midst of adding a ton of curb appeal to our home, it’s made it real obvious that I need a show stopping wreath for the front door. I love making wreaths (especially seasonal ones), but sometimes life is too crazy and you need to pull in the big guns…..Etsy. Here are 14 farmhouse style wreaths that you need for your front door. Adina Pepperberry Wreath – The colors of the pepperberries mixed with the seeded eucalyptus on this wreath make it hard to not love. It’s perfect for the holiday season! They also sell their amazing handcrafted wreaths, fresh flowers (delivered in the Bay Area) and gifts at ClubBotanic.com. Welcome Round Circle Hanger – I was looking for farmhouse style wreath with a hint of shiplap….because well #shiplap. I found this little gem and I think it’s adorable. Preserved Boxwood Wreath – The clean look of this farmhouse wreath will fit right it to a traditional or modern farmhouse decor style. I love the brighter colors of this wreath. I’d also enjoy the smell of the preserved boxwood leaves. Rustic Wheat Wreath – I love the simplicity and bold colors of this rustic wheat wreath. Although it is absolutely perfect for fall, I bet you could get away with displaying it all year round if you wanted to. Cotton Wreath – Cotton stems and wreaths really took the farmhouse world by storm over the past couple years and I’m still loving them. This farmhouse cotton wreath is so unique with the twigs and dried pods. 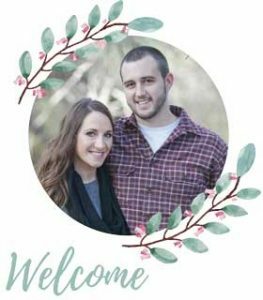 Welcome Y’all Family Name Sign – This customized farmhouse style round sign is perfect to welcome guests at your front door! Along with selling on Etsy, she also sells her signs at EngrainedFarmhouse.com. Give Thanks Pumpkin Door Hanger – Since we’re officially at the kick off fall here, I couldn’t resist this adorable little pumpkin door hanger. You could even personalize it with a custom word or phrase if you’d like! Boxwood Wreath with Lavender & White Flowers – This farmhouse style wreath is the definition of show stopper! I love the wispy pieces of lavender and white flowers coming out of the rustic wreath made with either eucalyptus or boxwood. Dried Lavender and Eucalyptus Wreath – I can almost smell that wonderful lavender and eucalyptus fragrance just by looking at the photos of this farmhouse style wreath. This wreath would be perfect for your farmhouse all season long. Lamb’s Ear and Eucalyptus Wreath – This dramatic wreath has obvious farmhouse style and I’m a little bit in love. I love the mix of the lamb’s ear and eucalyptus, along with the added texture of the eucalyptus berries. Burlap Thankful Wreath – This dramatic farmhouse wreath is perfect for the fall season! I love the added touch of the cotton stems and fun ribbon on the top and the bottom of this oval wreath. That “thankful grateful blessed” sign in the middle add so much character too! Fall Pumpkin Wreath – The pastel and neutral colors on this grapevine wreath for fall are amazing! I love the way this farmhouse style wreath fits into the vintage decor. I’m so ready for fall…bring on the pumpkins! Magnolia Wreath – Magnolia wreaths are pretty much the epitome of the farmhouse style. I guess we can thank Joanna for that. 🙂 I love the look of this magnolia wreath on a grapevine base. Windmill Front Door Hanger – I love this adorable windmill door sign! You can customize the word in the middle as well, but I think “Welcome” is perfect if you are putting this farmhouse wreath on your front door. Any one of these farmhouse style wreaths would add so much character to your front door. I bet your neighbors would come over and be knocking on your door wondering where you got it! If you are looking for a way to add instant curb appeal and farmhouse charm to your front door, snag one of these farmhouse style wreaths. So…now it’s your turn! 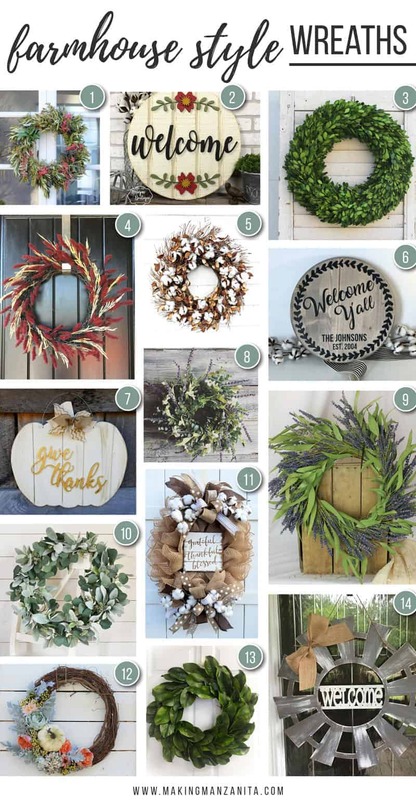 Which one of these farmhouse style wreaths would you put on your front door? Oh I think I really like #10. Iove the various colors in the wreath!! Hard choice because I really love all of them!!! I know I love them all too!!! If only I had 14 front doors to put them on, haha!